About Russian cooking and cuisine. Recipes. Russian cuisine from ancient times, Cooking and Recipes. "A house is not famed for its fine interior but for its pies and cakes"
(i. e. its host's hospitality). Even for a scanty meal Russians used to spread a linen tablecloth which showed how much they respected meals. It used to be spread even in the poorest houses, with just boiled potatoes for the meal. On festive occasion and to honour a high-ranking guest the best white tablecloth with embroidery would be spread. For starters, numerous appetizers (zakusri) such as caviar, tiny open - faced sandwiches, could cuts and vegetables are bright to the table to accompany toasts made in honour of everything imaginable. 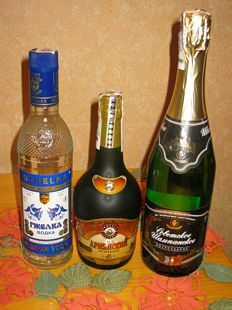 Vodka, of course, is poured for many of these toasts, although it is not uncommon to see cognacs, flavoured liqueurs, or champagne on special occasions. After the appetisers, more substantial dishes are served. Soups, such as borscht made from beets and shchi made from cabbage, are eaten together with pirozhki - pastries stuffed with cabbage, meats or fruits. It is a well-known fact that since the time immemorial Russians have used wooden spoons. There are several reasons for it. Wooden spoons were cheap, the material being easily available and carvable, so that spoons could be carved by any family. Another consideration was that ancestral Russians were fond of very hot food. A wooden spoon would not burn one's lips or tongue. Boiling - hot soup will cool in a wooden spoon. Every member of the family had a spoon of his own, often marked with his (her) name or with some other sign. It was advisable for the family to have separate spoons in order to prevent the appearance of sores in the corners of one's mouth. Wood, which could be easily carved, poker - worked, polished, painted and varnished, has become very handy for making all kinds of utensils: spoons, saltcellars, bowls, dippers, plates, bread - plates, dishes, flour barrels, buckets and the yoke to carry them on, traditional Russian toys. Salt and flour remained dry in wooden boxes and containers. Wooden chopping boards are better than plastic ones for fighting bacteria. A skilful craftsman would turn the wooden utensils into works art.